A cool little video of how a zebra foal drifting away during a Mara River crossing manages to get to shore with the help of a female hippo. Many tourists visit the Mara River crossings every year, in hopes of witnessing one of the most spectacular and popular animal migrations known. Images portraying the ‘red in tooth and claw’ struggle of Wildebeest and Zebra to get to better grazing grounds abound. Incidents like these are still few and scattered, but are always a breath of fresh air. 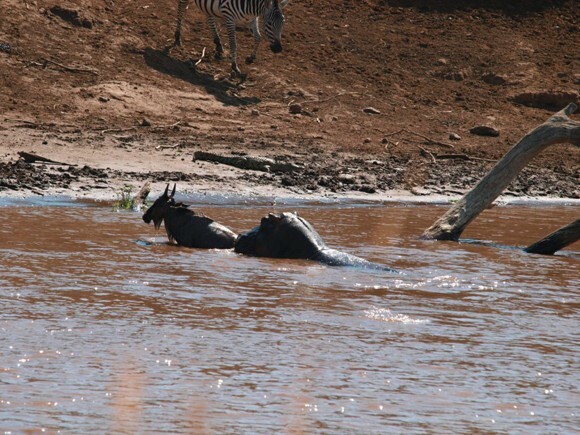 An image of the heroine hippo and the zebra foal on shore. Incidentally, the same hippo was reported to have helped a Wildebeest calf in a similar incident, only 10 minutes before.